There was much excitement in our house when my son Fergus, 9, got a cartoon in The Dandy. It was in last week's issue. He came third, out of five, in a competition to design a character for the comic strip The Bogies. Congratulations to your son....a booger off the old block!!! great stuff! congrats to the little guy. i think he's got a great style, as i've told you before. hey, it say 'Click here to buy Royston's book' -- where's the fergus book option? 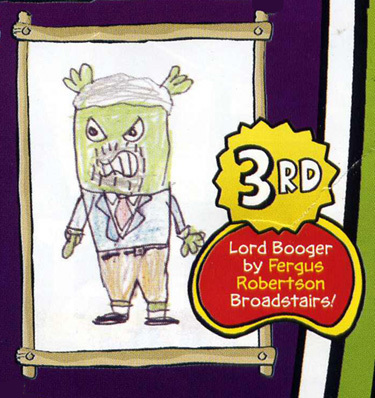 Hurrah for Lord Booger! May he always be crusty and infectious. Thanks for all the comments, folks. The strip can be seen in this week's Dandy. Lord Booger starts off by saying "You're fired!" to Fergus and the artist! Bit late I guess. But yes. Well done Fergus. I enjoyed drawing it.